Combine two of South America's most iconic destinations in this superb highlights trip. First discover the spectacular 'Lost City' of Machu Picchu, before spending six days exploring one of the best wildlife experiences on earth; the Galapagos Islands. Arrive Cusco (3400m) and check-in to the hotel. The old capital of the Inca Empire survives only in its ruins, imbued with an atmosphere of mystery and grandeur. The Spanish colonial city, with its attractive pink tiled roofs, arcaded plazas and steep winding alleyways, stands upon tremendous Inca foundation stones. The morning is free to rest and get acclimitised to the altitude. In the afternoon we take a walking tour of this lovely city to see important Inca and Colonial monuments, such as the Plaza de Armas (main square), the cathedral, the Inca site of Qorikancha and the Inca wall of Hatunrumiyoc with its famous twelve-sided stone. The stone, measuring some 1.5 metres across, has the typical bevelled joints which create the patterns of light and shadow on Inca walls. Today we enjoy a tour of the Sacred Valley of the Incas. We will visit the market town of Pisac, strategically located at the head of the Urubamba Valley. Pisac once controlled the road connecting the Inca Empire with Paucartambo on its eastern borders and the magnificent Inca ruins that once so dominated this valley still occupy the mountainside above the town, providing a worthy match for any of the temples of Machu Picchu. We will also stop at Ollantaytambo. During the Inca Empire it was the royal state of Emperor Pachacuti who conquered the region and built the town as a ceremonial centre. We will visit its majestic fortress. Late this afternoon we transfer to the railway station to catch the train to Aguas Calientes, the gateway to one of the greatest of all archaeological sites. The train slowly meanders down the valley, following the tumultuous waters of the Urubamba River through a series of rock cut tunnels before emerging at the small town of Aguas Calientes, serenely nestling amidst a lush landscape of cloudforests. This evening there is the chance to soak in the nearby natural hot baths. Early this morning we take a public bus up to the mountain complex of Machu Picchu, the fabled 'lost city' of the Incas and probably the most spectacular feat of engineering in ancient America. The existence of this exquisite masterpiece of ancient civilisation remained unknown to the outside world until it was 'discovered' by an American archaeologist, Hiram Bingham in 1911. Temples, stairways, palaces and gabled stone dwellings are scattered everywhere, testifying to the energy and ingenuity of the builders. Not without reason is this site probably the most revered tourist attraction in the Americas; its location alone is dramatic in the extreme, teetering on the saddle of a high mountain peak that towers above the valley below. Built in the mid-15th century by Pachacuti, the city was thought to have been a major agricultural centre for the Incan Empire and its inaccessibility seems to have preserved it from the looters of the intervening years, resulting in the remarkably well-preserved ruins that we see today. In the afternoon, we return to Cusco, by train to Ollantaytambo and the rest of the way by bus. Today is a free day with a wide choice of things to do including a tour of the South Valley including Tipon, Pikillacta and Andahuayillas. Alternatively, you may wish to visit some of the outlying Inca sites including Cusco's temple-citadel, Sacsayhuaman which broods high above the town, its huge, zigzagging stone walls broken into 66 sharply projecting angles to catch attackers in a withering crossfire. 20,000 conscripted workers toiled for 90 years to finish it. You will also visit Quenqo, an immense rocky construction, similar to a maze, Pucapucara (red fortress) and Tambomachay (bath of the Incas). There is also the opportunity to visit Maras and Moray. The amphitheatre-like terracing of Moray is a fascinating spectacle. Some believe the Incas used the terraces to determine the optimal conditions for growing crops of each species. Today we transfer to Cusco Airport and fly via Lima to Quito. Quito is Ecuador's mountain capital and the second highest capital city in Latin America (2850m). One of South America's most beautiful cities, Quito lies in a narrow valley at the foot of the Pichincha Volcano, surrounded by snow-capped mountains and extinct volcanoes. Today we explore Quito's Old Town on a walking tour. The fascinating UNESCO Heritage site of the Old Town, with its rich blend of colonial architecture, imposing churches and bustling local markets, make for a stunning introduction to this most enchanting of regions. We will visit some of the main sites, including the Plaza de la Independencia, the cultural heart of the colonial city, and La Compania Church with its magnificent gilded altars, walls and ceilings. At the church of San Francisco we are introduced to Quito's largest and oldest colonial church, built in 1553. Lying on the Equator, 970km west of the Ecuadorean coast, the Galapagos National Park is a unique collection of islands, formed by volcanoes over hundreds of thousands of years and consists of six main islands, 12 smaller islands as well as over 40 small islets, supporting a distinct and unique flora and fauna, including prehistoric creatures found nowhere else on earth. This desolate and fantastic habitat was discovered in 1535 by Fray Tomas de Berlanga. One of the original designations by him was 'Las Islas Encantadas', the Enchanted Isles. Charles Darwin visited the islands on the Beagle exactly three hundred years later, in 1835. He observed the total isolation of the giant reptiles and other creatures, and this played a substantial part in his formulation of the theory of evolution. The Galapagos National Park charges a visitor fee, payable on arrival, which funds park maintenance and supervision in the Galapagos, as well as ecological study, conservation and infrastructure development in Ecuador's other national parks. Entry fees and the funds they generate for the national park system are among measures taken by the Ecuadorian government to protect its natural heritage. Today we fly to the Galapagos island of Santa Cruz. Santa Cruz is the second largest island in the Galapagos and has the largest population, with Puerto Ayora as its main town. It also boasts the most varied of the islands' vegetation zones: coastal, transition, scalesia, miconia and pampa. We will travel through the highlands, stopping at Los Gemelos (the twins), two volcanic craters. Later, we will visit a ranch where we might see some giant tortoises roaming around. Next we will be transferred to our lodge in the highlands. In the evening, the lodge provides a free transfer to Puerto Ayora which you may wish to take to explore the town or have dinner there. This morning we leave Santa Cruz and journey west by boat, crossing the open waters to nearby Isabela Island where we will spend the next two days. The largest of the Galapagos Islands, Isabela is formed from five volcanoes, of which two are still active. An idyllic paradise of white sand beaches and swaying palms, it is home to the second largest caldera on earth and the highest point in the archipelago. As with Santa Cruz we will base ourselves here, in the small town of Puerto Villamil on the southern coast, and take excursions out around the island. This morning we will take a small boat to the nearby Tintoreras Islets. These islets were formed from the lava flows from volcanoes and are fantastic for viewing wildlife. The bay in front of the islands is home to a colony of white tip sharks. As we walk around we may see a vast array of birdlife and an abundance of marine iguanas (only found in the Galapagos) whilst in the water giant turtles, Galapagos penguins and sea lions may be swimming around. In the afternoon we take the boat back to Santa Cruz Island where we will spend the next three nights. This morning we will take a walk to Tortuga Bay (5km return walk) where we have the opportunity to swim at one of the most spectacular beaches in the Galapagos Islands and an important turtle nesting ground. In the afternoon, we will visit Charles Darwin Research Station, which has been responsible for conservation projects within the islands since 1959 (the centenary of the publication of Darwin's book the Origin of the Species). Here, an exhibition centre displays photos of recent volcanic eruptions, charts outlining geological formations and drawings of the evolutionary development of endemic species. A corral houses adult Galapagos tortoises, and a nursery cares for young tortoises until they are about three years old, when their shells have hardened enough to resist attack from feral dogs. The Research Station is also the training centre for naturalist guides who accompany all visitors and members of the international scientific community often come to study at the station. Today we will be taking a full day boat trip to one of the smaller islands of the Galapagos, which will be either Seymour, Bartolome, Santa Fe or Plazas Island depending on the schedule of the yachts departing from Santa Cruz. Depending on the island, we will be seeing sea lions playing in the water just off shore, land iguanas strolling around their land, magnificent red-throated frigate birds, blue footed boobies, swallow-tail gulls or Galapagos penguins. Time permitting we will also have the opportunity for some snorkelling or hiking about the island. 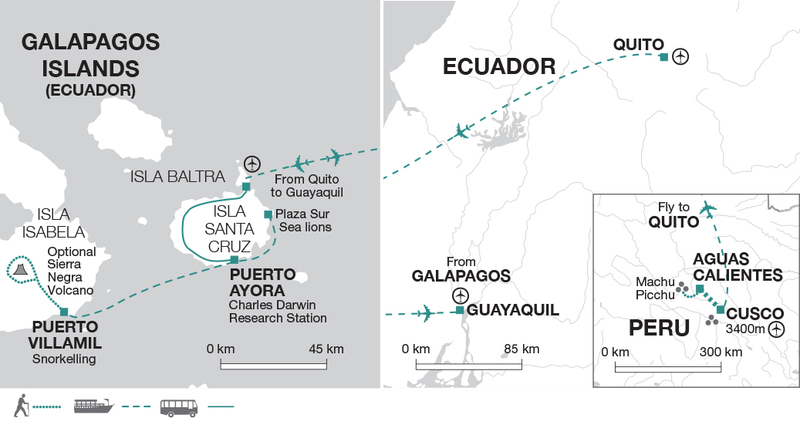 Leaving the Galapagos behind, we fly to Guayaquil today. On arrival the rest of the day is free to explore at your leisure. The largest city in Ecuador and its principal port, Guayaquil is a bustling, lively city with a number of churches and museums you might like to visit. Alternatively you might like to wander through the old district of Las Penas, an area of cobbled streets, painted houses and cafes, where you can sit and watch the world go by. The trip ends in Guayaquil this morning after breakfast. Snorkel equipment - Snorkel/ Mask and Fins hire - US$10 per day plus US$20 deposit ; Kayak rental per hour US$30 for 2 pers. Daytime clothing should be lightweight and loose fitting, but warmer clothing is needed at altitude and at sea, particularly at night, so bring something to wrap up in, including a pair of gloves, hat and scarf. Long-sleeved lightweight clothes are useful for protection against sunburn. Bring a swimsuit, sunhat and a thick sweater or fleece. Lightweight waterproofs are essential. One main piece of luggage and a daypack. You will need an overnight bag for the two nights on Isabella Island, your main luggage will be stored in your hotel in Santa Cruz. A torch, water bottle, sunglasses, insect repellent, high factor sunscreen, beach towel, waterproof bag for camera, and motion sickness tablets / patches for the boat. Snorkel equipment is available for rent locally, but you may wish to take your own if you're a keen snorkeler. You should allow US$40 for the land portion of the trip and US$70 ($30 for local guide and $40 rest of staff) for the Galapagos portion of the trip for tipping. The Galapagos Authorities have introduced the Galapagos Transit Control Card, which each person visiting the Galapagos must have. It costs $20 and it will be payable before entrance is permitted. Please also note that there is an entrance fee to the Galapagos of US$100 per person which must be paid individually on arrival in the Galapagos. There is an additional entry fee of US$10 per person to visit Isabela Island. All these local fees to visit Galapagos are subject to change. Peru: Visas are not required for UK, New Zealand, Australian, US and Canadian citizens. Other nationalities should consult the relevant consulate. Please note we require a photocopy of your passport 3 month pre departure. This tour is ideal for travellers who are interested in both culture and nature. Spend one week exploring the best of Peru and one week discovering the wildlife of the Galapagos, by boat during the day but overnight on terra firma. This will allow you to stay on Santa Cruz and Isabela Islands and experience the Galapagos from a different perspective.